Q:Tell us why you think supporting local, independent businesses is important to you? Keeping it personal- we all know where our money is going. Keeping it quality by having business owners accountable for their goods and services, as opposed to big business where no one is responsible, so when quality goes down no one is taking responsibility to ensure that change will happen. Keeping our dollars in our town so that our downtown area remains a thriving, busy, economic draw for others. Keeping innovation happening by providing seed money to interesting new businesses such as the Power House’s new Marker’s Lab. Q: What are the services that you offer? What makes you unique? A: We provide a very small school community where everyone gets to know each other. There is a low student teacher ratio and we get to know our students very well and accept them for the person that they are and embracing their unique qualities- not trying to make them someone else. Montessori is highly individualized which leads to instruction frequently being delivered in small group instruction. Children are in mixed age groups so that they can nimbly move from lessons that will challenge them in areas that they excel at, to those that will provide extra support in areas where it is needed. This means, for example, that a six-year old child may be attending reading instruction with peers his own age and math instruction with peers older than him. A child’s grade is not the emphasis, their ability is, along with assuring that the child’s needs are being met, instead of being forced to be someone they are not yet prepared to be. In order to realize all of theses intentions, Montessori has a low student teacher ratio; a lead teacher in the classroom provides the majority of the lessons, with an assistant to support students during work time. Lead teachers are highly qualified to be in a Montessori classroom. In order to become an elementary level Montessori teacher one must attend a certified MACTE (Montessori Accreditation Council for Teacher Education) program with coursework specific to the age range that they wish to teach. Q:People don’t always realize how impactful small businesses are in the community. Can you tell us a little about how you make Durango a better place? A: As educators we are helping create future citizens of Durango! In addition, just our existence supports other local businesses including the Smiley Cafe, Stillwater Foundation, the Smiley Building, DAC, and the public library. Q:When you’re not at work, what is one of your favorite local places in town? A: I like to spend time at Yunomi Pottery Studio, Pilates Durango, and El Moro! Q: Thank you for being a member of Local First! Why do you think supporting local, independent businesses is important? Dan: Big picture, it’s really at the core of my training in college and in medical school and it’s the reason that we decided to move to Durango. Karassa is from Mancos and we wanted to be closer to home, and also wanted to raise our kids in a community that is focused inside-out instead of outside-in. Additionally, as two people who recently opened a small business, the satisfaction really comes from working with other small local businesses that not only like the idea of our practice but can really invest and speak with their feet and their purchasing power. Our philosophy of practice is eliminating distractions and limiting third party interactions to give individuals control over the situation. We believe this because health IS a local issue; it’s local to the individual, it’s local to their family and to the community that they live in, and that’s been forgotten in the medical field. Even before we opened Whole Health Family Medicine Clinic a year-and-a-half ago, we have always believed it’s important to not only get to know our patients, but also their families, their hobbies, and the context of their lives so we can help give them the best treatment possible. Q: Can you tell us about the services offered at Whole Health and why it’s unique? Karassa: We are a Direct Primary Care practice, which is a membership based model where we don’t contract with insurance companies and instead partner with the patients directly. Patients pay an affordable monthly membership fee in exchange for unrestricted visits (no copays, no additional fees for those visits, or deductibles). This really allows for the patient to be in the driver seat for how they access their care. There are many frustrations to the current health care system, whether the issue is unaffordable health care, inadequate access, not enough time to address medical needs, or not being able to communicate directly with the provider, we are here to provide a solution. Dan: We also collaborate directly with small businesses to develop health care options for employees that can compete with mainstream healthcare options. We know that it’s hard to offer health care benefits to employees but at the same time it’s very important for employee retention. By using the direct primary health care model and our business membership option, it allows small business owners to provide affordable, accessible, personalized healthcare. Q: People don’t always realize how much small businesses do for their community. What does your business do to make Durango a better place? 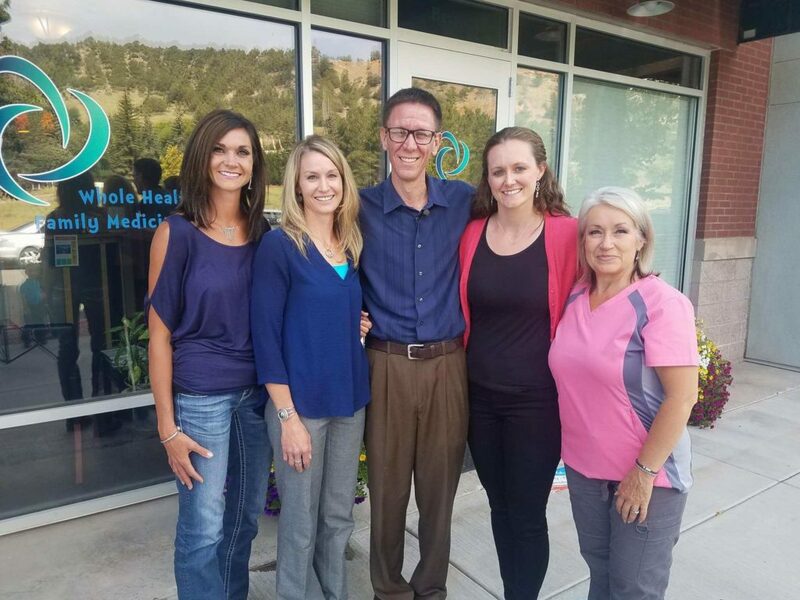 Dan: We are involved with helping support the local business community by attending Economic Alliance meetings, Chamber events, and volunteering for the 9Health Fair. We are also very involved through our children. We have two boys, ages 3 and 5, so they keep us busy and get us involved in our community. Additionally, we really advocate for individuals and small businesses taking charge, especially in health. Insurance and pharmaceutical companies have a lot of influence over the health industry and we have stepped out of that model with our local, independent grassroots business. We advocate every day to keep those third parties out of the exam room. We use the Direct Primary Care model to keep the focus on local health care so more people can have access to these services. Q: When you’re not here at your business what is your favorite local spot to go to? We love the Rec Center! An interview between Monique DiGiorgio, Local First Managing Director and Kamaljit Punia, Director of Marketing and Outreach at Durango Natural Foods. 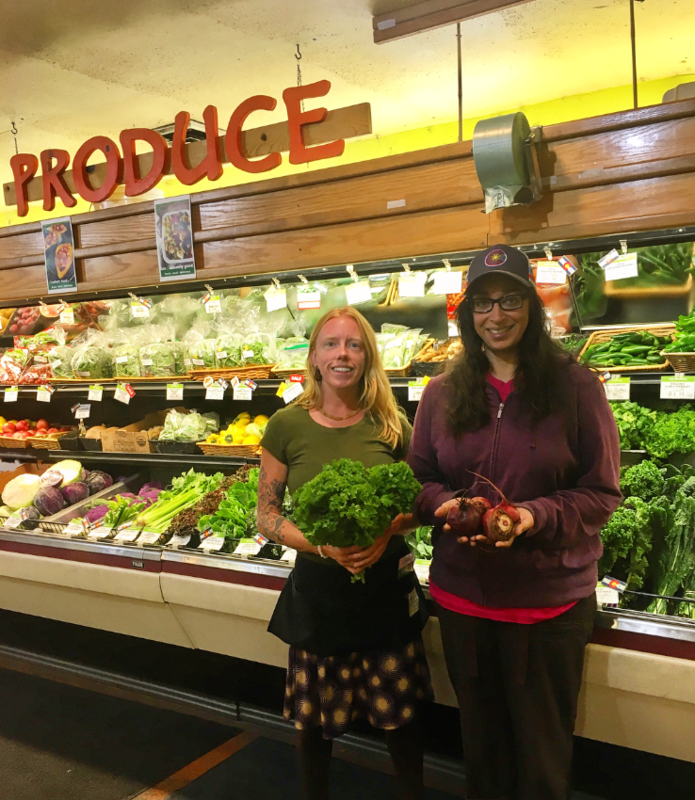 Kamaljit Punia and employee Crystal Mondor present some of the colorful and tasty local produce found at DNF. Q: Thank you for being a member of Local First! Could you tell us why you think local, independent businesses are important for the community? Kamaljit: What I always say for DNF, because we get asked very similar questions on why people should support us instead of a regular grocery store is the resilience it creates in our community. To say that we have a little buffer zone so that we are not at the whim of whatever happens in Washington D.C. politically, that we have cooperation and economic resilience so that we can weather any of the storm those politics make and in the best case scenario, it doesn’t even get this far and affect us at all. Q: Can you tell us about the service that Durango Natural Foods offers and what the benefits are for being a member of a co-op? There are so many! Being part of this co-op is more than just being a member of a grocery store, you are a member of a movement. That movement includes having respect and taking care of the land and the earth, your local economy, and your community by making sure that everyone in your community has access to the things they want or need. That may not just be groceries, it could be a specific product or even a service, like needing a garden at a school. We can call on our partners like SouthWest Garden Project and help make that happen. We are really serving as a central location where you could express your needs and we bring the resources where they are needed. Another important service that we offer that most people don’t know are our services to other businesses. We call this our Outside Sales Program so if a business comes to us and needs cases and cases of an item, such as Harvest Grill does for lemonade and chips, we order that item for them and help them source locally for items that they have trouble getting otherwise! Q: What does Durango Natural Foods do to make Durango a better place? I’m glad you asked and I’m going to refer to our 2016 Annual Report because these numbers surprised me! When I decided I wanted to create an infographic of where our money was going I didn’t realize just how big of an impact we were making. You know we are a nonprofit so any money that we make above operational costs we reinvest back into the community so we keep our primary focus on purchasing local produce and products. Last year we spent $185,673 with local farmers and producers! That’s why we call ourselves a small store with big impact. When stuff breaks around here, which refrigerators love to do, we spent $100,135 in local services for repair. In total DNF spent $843,406 dollars locally, reinvesting money back into the community. Q: When you aren’t spending time at DNF, what’s your favorite local spot? Oh there are so many! I live over on 32nd so I am loving how the North Side is blowing up!! I have some North Side love so Zia’s, 81301, and North Slice are some of my favorite places to hang out. Q: Please tell us a little about thrive and why it’s important for businesses to provide a living wage? A: Thrive’s goal is for all workers in La Plata County to be paid a living wage. It’s obvious that it’s important for workers to be paid a living wage so they can afford housing, food, childcare, transportation, health care – they are going to meet their basic needs and that is important for everyone in our community, and I think that’s what we want our community to look like. Q: Why are you a non-profit member of Local First? Why is it a value to you? A: The idea is that we are on a similar course. It’s really about the success and quality of life in our community. So, when people buy local, that supports our community. When people are paid a living wage, that supports all the members in our community and the business, economically, it’s a good idea for people to make a living wage so they have money to spend in the community. So the idea is “Buy local, buy living wage,” addressing consumers – we want consumers to support businesses that are paying a living wage and that are local where the money is staying in our community so everybody benefits. Q:Tell us about any exciting events/programs you are doing? A: Our longest standing program is the Employer Recognition Program where we certify employers that are paying a living wage or aspiring to pay a living wage. So that by promoting that in the community more and more businesses will see the importance of paying a living wage and the consumers in the community will understand what is a living wage versus a minimum wage which is a concept that we all grew up with. We just certified our 100th business and we started in the end of 2014, so just over 2.5 years. When I say businesses, that is for profit and non-profit. The other thing we work hard on doing is educating the community on why a living wage is important. So, we do this by going to the farmers’ market and different events in the community, talking to people, giving out information. Also we have a premier educational program every year. This year we are planning for the fall an educational program on early childhood care and education which is a very interesting area because people who are employed in that sector are usually generally not paid well. Parents struggle to afford day care and it keeps a lot of people out of the workplace. People who are running day care centers struggle to make it work both for their employees and the parents. Really, the bottom line is the benefit to children of that care and that is seen decades later when they are adults. They have a better shot at having a good job, and they do better if that have that early childhood education care. So, it’s a big issue. And in our country, it’s not affordable for most people. It either takes them out of the market or children are left in an unsafe situation. Also, advocacy for a living wage. Last fall we were part of the statewide coalition that worked for an increase in the state minimum wage of $12.00/hr by 2020 which was successful. That doesn’t quite get people to a living wage, which right now is $12.98 for a single person, but it is closer. So, we’ll take steps to get there. Finally, we have a fundraiser coming up monday -friday (Dine Out Durango! Apr. 17-21). We have 7 restaurants who are going to be giving us a percentage of what they take in during that week. We are encouraging people to dine out at these restaurants who are all living wage employers in the food and beverage business in town. We will hopefully build on that every year. We decided to do this in the mud season, a slow time for the businesses, it’s really not the tourists we are trying to attract to this, but the locals to teach them about this and encourage them to support living wage employers. So, this is their time to step out and dine out. Q: How can our organizations work together? A: I really do think the message is “do business locally and living wage.” Support local, support living wage. 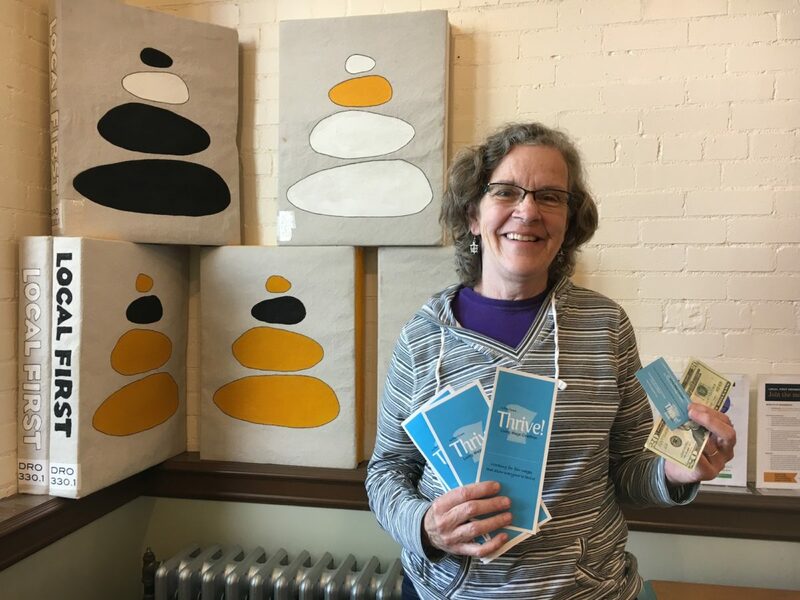 So at every possibly intersection we are going to work together and just recently we started doing that with the Be Local Coupon Book recognizing of the Local First members in the book, some of them are living wage employers. So there is a lot of crossover there for our business. And there is tons more we can do with that! We will be as creative as we can be. 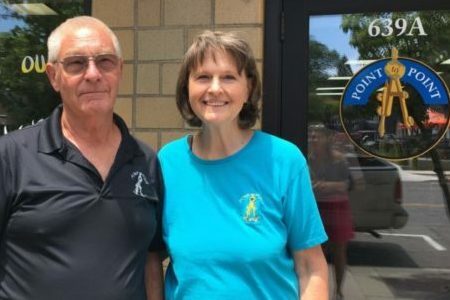 An interview between Kiki Hooton, our Americorps VISTA and Jim and Linda Burton, owners of Point to Point Graphics. Q:Thank you again for becoming a member of Local First! Could you tell us why you think it’s important to support local, independent businesses? Jim: I think it’s very important for the community, we try to buy everything local. We very rarely go to Farmington and we don’t use the big box stores even though the price may be cheaper. We are celebrating our 15 year anniversary and the entire time we’ve stuck to local, because we’re local. We are a family run business and the local people have been good to us so we treat them the same. Linda: It keeps the money in the area instead of going elsewhere and supports the families that work here and want to live here, so that is very important to us. Q:That’s great. Can you tell us quickly about the services that you offer? Linda: We do printing and copying of large and small format, a lot of architectural printing, custom apparel, embroidery and final heat press, and we sell office supplies. We are the only local office supplies store in Durango. We keep our equipment up to date to give a competitive product at a competitive price. We’ve tried to focus hard on a quality product on a quick timeline and I think we’ve met that. We don’t have to do any advertising because our clients always come back! Q:A lot of people don’t always realize how impactful small businesses are in the community. Can you tell us a little about how you make Durango a better place? Jim: We donate all of the printing for veterans and christian organizations. Like we said we are a family run business.Our oldest son and his wife, as well as our grandkids work here in the summer. Our oldest grandson Daniel started when he was 10 and now goes to Fort Lewis. We send him jobs and help support him while he is in school. Linda: We are really supportive of our staff in general and have provided steady work over the years. We have one employee we are helping go through the graphics department at Fort Lewis, she has a key and can come in and do work on her own schedule. We also use a Local Book Keeper who went to Durango High School and Fort Lewis. She now has two little ones and so we let her work remotely after hours so that she doesn’t have to leave them unsupervised. Q:That’s awesome that you are so supportive of your staff! Last question, when you’re not at work what is one of your favorite local places in town? Jim: Our favorite place is probably the Kennebec Cafe, I’ve known Barbara for years and years. We probably have dinner or breakfast up there once a week. We also love CJ’s because they deliver and their food is delicious! Q: Congratulations on the Green Business Leadership Award! Can you tell us what that award means to you and what it means to be a “green business”? A: Well, it means a lot to me to be recognized for our efforts to produce ice cream in an environmentally sustainable manner and gaining the award helps to draw attention to that. 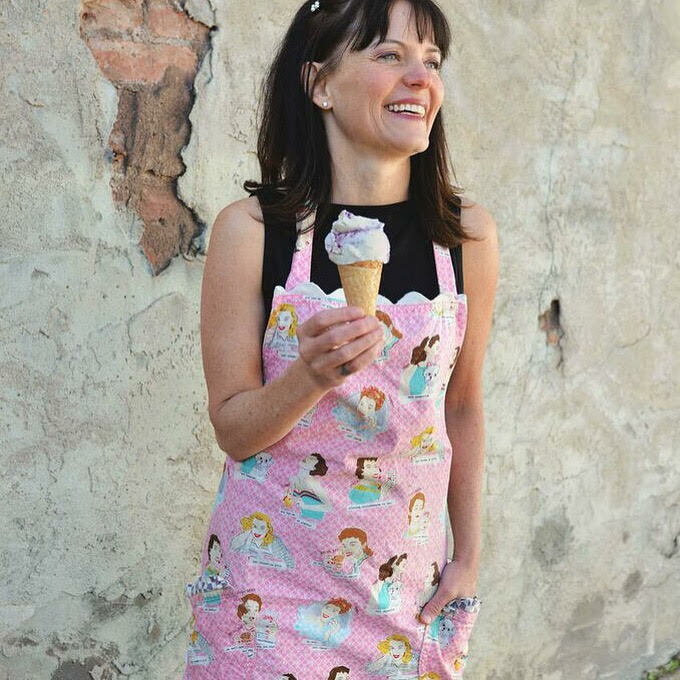 I want people to know us for the quality of our ice cream, but as a business I feel it is important ethically to be environmentally sustainable. Q: What are some of the “green” practices you employ in your business? A: There are a few different areas where we focus our environmental practices: conservation of energy and resources using energy star rated equipment when available, fixtures that use less power, and then also in purchasing disposables that are produced with less waste that are recyclable and bio-degradable and also in our sourcing — getting organic and local ingredients that have less of an impact on the environment in their production. One of the challenges when I started is looking at recipes I had and the ingredients that are available locally — and they don’t always match up. Over the years, I have been able to identify more and more sources for local ingredients and then also become knowledgeable about what is available locally and look for ways I can incorporate that — so reverse engineering my recipes based on what is available. Q: What does it mean to be a local, independent business? A: There is so much I can say about that topic! It’s given me a whole new appreciation for my community and how, as a business owner, you are part of an interdependent ecosystem. That is something I under-appreciated when I started — that I was entering a community of supportive counterparts who would really go above and beyond to help with my success. And now that I have been doing this for awhile, I try to pay that back and be a resource for other people that are getting started. Learn more about Cream Bean Berry’s flavors and hours here!